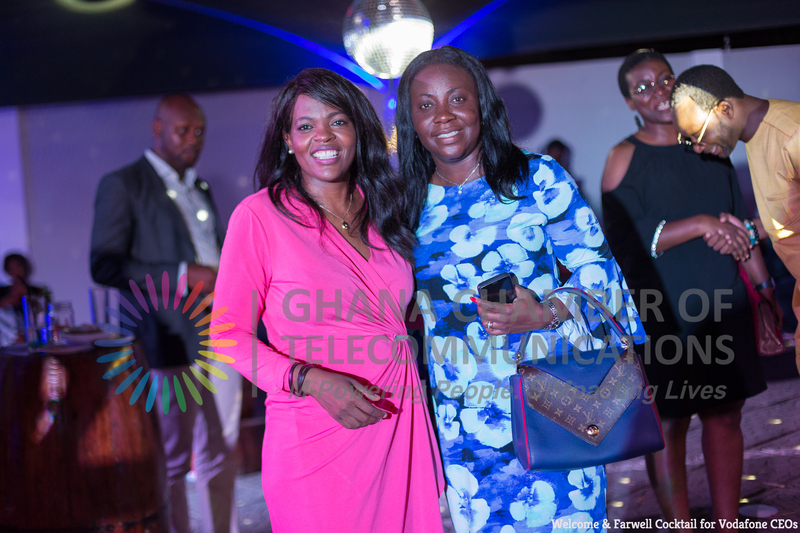 The Ghana Chamber of Telecommunications has organized a farewell and welcome cocktail in honour of the outgoing and incoming Chief Executives of Vodafone; Ms Yolanda Cuba and Mrs Patricia Obo-Nai respectively on 1st April in Cantonments-Accra. Chief Executive Officer of AirtelTigo, Mitwa Kaemba Ng’ambi also described Ms. Cuba in her remarks as an authentic personality and a role model for her personally. According to Mitwa the outgoing Chief Executive was passionate and committed to her work when she was at the helm of Vodafone. “People can be committed to and passionate about lots of things, but this by itself is not enough. Authenticity is when someone believes in what they say or acts in a way that is consistent with their beliefs and that is the characteristics of Ms. Yolanda Cuba.” She remarked. Mr. Joe Anokye, Director General of the National Communications Authority in a speech lauded Ms. Cuba for her tremendous work at Vodafone especially leading her team to deploy 4G services to their customers. He described the move as a great accomplishment and a legacy that she’s leaving behind for the incoming CEO of Vodafone Ghana. Mr. Anokye also described Ms. Yolanda Cuba as a transformational leader and an accomplished business leader, who is widely regarded across the African continent. He disclosed that owing to her remarkable performance, commitment and passion to her work and the telecommunications industry, Ms. Cuba has inspired a lot of young girls who are aspiring to be like her. Ms. Yolanda Cuba in her acceptance speech recounted her journey with the Chamber and her competitors in pursuing policy and regulations that always sought to make the industry thrive and to offer world-class telecommunications services to Ghanaians. The Vice Chair of the Parliament Select Committee on Communications and MP for Sekondi Constituency, Western Region, Hon. Andrew Kofi Egyapa Mercer in his remarks pledged the Committee’s willingness and preparedness to collaborate and strengthen existing relationship with the industry to develop policies that will inure to the benefit of all. Incoming CEO of Vodafone, Mrs Patricia Obo- Nai in her acceptance speech, pledged to continue and build upon the legacy of Ms. Cuba, working with the Chamber and the mobile industry to ensure business sustainability and more improved customer experience. An Engineer by profession, she comes into her new role with 22 years of experience in Information Technology (IT) and Telecommunications. In addition, she has extensive commercial experience in the telecommunications industry. Until her appointment, Patricia was the Director of Fixed Business and Customer Operations of Vodafone Ghana.